Endowments are significant investments in the future of Hennepin Healthcare or a specific program that has inspired you. They are powerful symbols of stability and trust in our mission. Our endowments are actively managed to grow the principal and provide additional income for programming each year. We welcome your interest in contributing to an existing endowment or creating your own unique long-term legacy and relationship with us. Contact: Jesse Hicks, Director of Development, 612-873-3125. Many programs rely on in-kind donations and financial contributions to purchase specific items to provide a more comfortable experience or empower patients to healthier outcomes. To comply with infection prevention and to respect the dignity of those we serve, donated items must be new, unless noted. For questions on items, forming an in-kind drive at your workplace, or to schedule a delivery, please contact Hennepin Healthcare Foundation at [email protected] or 612-873-6090. Children’s Literacy connects children with books because literacy experiences are critical to a child’s healthy development. Patient Experience manages the emergency clothing service for adults and children within HCMC. The goal of the service is to provide patients, who have no other resources, a set of clean and dignified clothes to return home at discharge. Patients in need of clothing are those who have arrived at the hospital because of traumatic injury, newborn babies, people who are homeless, and others whose clothing is unsuited to the weather or to the special needs of their injury or illness. Each year about 5,000 individuals benefit from this service. For more information, please contact [email protected] or 612-873-4112. 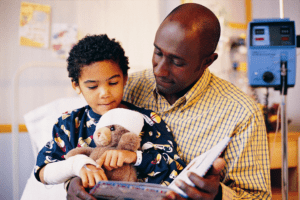 Illness and hospitalization are stressful events in the lives of children and their families. By providing age-appropriate activities and distractions, we hope to minimize stress and help children and their families cope positively with their healthcare experience. The Extraordinary Kids Fund was created to inspire donors who wish to bring joy to our pediatric patients. Explore our wish list on Amazon. Surgery Dolls are hand sewn items that allow staff to explain procedures and determine the emotional well-being of our young patients. We welcome donations of these dolls throughout the year and have attached sewing instructions. This department provides sensitive support to patients and family members affected by crisis, illness or loss while respecting their culture, religion, value systems, and traditions. You can make your charitable dollars go further by having your employer match your gift to the Hennepin Healthcare Foundation at no additional cost to you. Check with your Human Resources department to learn if your employer will match your gift. Most companies ask you to complete and return a short form or may require our tax identification number, which is, 41-0845733. We invite you to leave a legacy in support of the mission of Hennepin Healthcare. 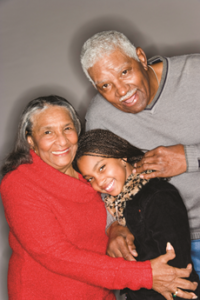 Give by naming Hennepin Healthcare Foundation in your will, trust, financial account, insurance policy or retirement plan. Please inform us of your plans so we can celebrate your generosity. We are happy to discuss your interest in donating securities such as stocks or bonds. Please call us for instructions and broker information. Grateful patients, families and community members can celebrate a special occasion or give thanks through a tribute gift or contribute a memorial gift in honor of a loved one. Simply follow the tribute/memorial instructions on our donation forms. Obituaries can direct mailed donations to: Hennepin Healthcare Foundation, 701 Park Avenue, LSB3, Mpls, MN 55415. Please include a note when directing a donation to a specific program. Our diverse range of health care programs, patient populations, community health initiatives, and medical education and research efforts offer impactful opportunities for corporate generosity. We welcome a conversation on the creative ways we can partner. Contact: Rebecca DeRosia, Senior Development Officer, Hennepin Healthcare Foundation [email protected], 612-873-7394. Generosity happens here because corporate partners have discovered how powerful their financial donations can be to the patient and family experience and to their own goals for civic engagement. Connect with a specific program that resonates with your customer or employee base. Support a capital project such as a family playroom, clinic space, or equipment purchase. Leave a legacy by naming a space in our hospital, one of our clinics, or an endowment. Adopt a program that relies on philanthropy: Extraordinary Kids, The Food [email protected], Children’s Literacy, Music Therapy, Artist in Residence, Emergency Clothing Closet, Family Lodging Fund. Publicly showcase your support for the critical role Hennepin Healthcare plays in our community by sponsoring our annual gala or other events throughout the year. There are a variety of opportunities to accommodate your budget. Involve your customers and our constituents in a joint effort to drive traffic to your business and donations to Hennepin Healthcare. Round up at the register and proceeds from sales are just a couple of examples of successful efforts. We welcome a discussion on tailoring a plan that fits your philanthropic and sales goals. 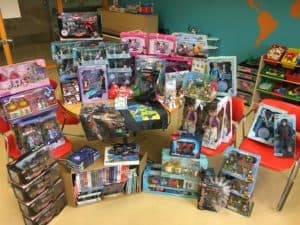 We are grateful for the valuable gifts of furniture, toiletries, books, food, toys, clothes, and electronics from company stock or employee in-kind drives. 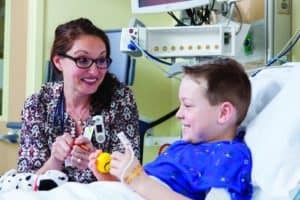 There are hundreds of moments when an act of kindness as simple as providing a hat in cold weather or a birthday toy during a hospital stay, is as powerful as the patient care. More information is on our in-kind donation tab. We welcome being a part of your annual workplace giving campaign or being approved as a corporate match recipient. Monthly gifts through payroll deduction or charitable giving portals are convenient options for employees to support the charities in their community. Assisting our food shelf, creating greeting cards for patients, or helping out at an event are a few ways corporate groups can volunteer their time and talents to improve the patient experience at HCMC. Staff often witness first hand the impact of generosity. Our annual workplace giving campaign Together We Care provides an opportunity for staff to support the charities of their choice through payroll deduction. Over $300,000 is raised for internal programs and external nonprofits each October. Throughout the year, staff have numerous opportunities to partner with the Foundation around their philanthropic interests. Contact [email protected] for more information. Gifts of time and talent are welcome and valuable ways to support the mission of Hennepin Healthcare and the efforts at HCMC. Learn more on the Hennepin Healthcare volunteer page. 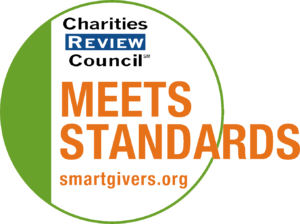 We are proud to have earned, once again, the Charities Review Council's Meets Standards seal, a visual marker of nonprofit strength. The voluntary review process examines four key areas: Public Disclosure, Governance, Financial Activity, and Fundraising. By earning the Meets Standards seal, Hennepin Healthcare Foundation demonstrates responsibility, integrity and transparency to donors as well as the general public. View our online report here.